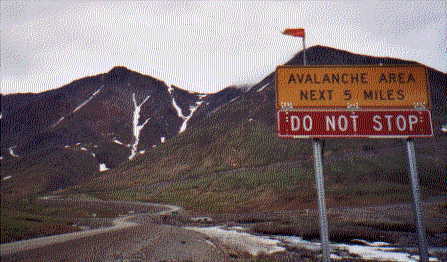 Right: Entering the Brooks Mountain Range. That's the pipeline on the far right. The blue ice is called "Aufeis." It forms during the winter months. Somewhere between Dawson City in the Yukon, and Fairbanks, Alaska I decided that I wanted to drive to the northernmost point of the US. I had been to the southernmost point (Key West, Florida) only 2 months earlier. Now I had the chance to the northernmost point. That was my next goal. I looked at a map to see how to get to THERE. THERE turned out to be a place called, "Deadhorse". 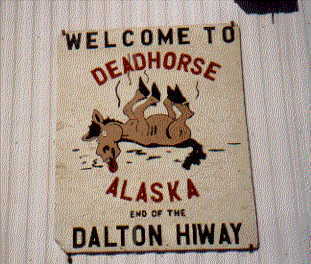 And the map showed that the only road leading to Deadhorse was called the Dalton Highway. Deadhorse, on Prudhoe Bay--right beside the Arctic Ocean! Well, that sounded appealing. So that was it--I was going to Deadhorse! Well, I didn't exactly have all that with me. 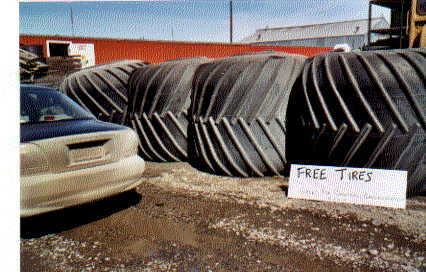 But I had one of those temporary "donut" spare tires in the trunk. And I had a can of "Fix-A-Flat". I had a couple of flashlights, canned food, water, camping stuff. 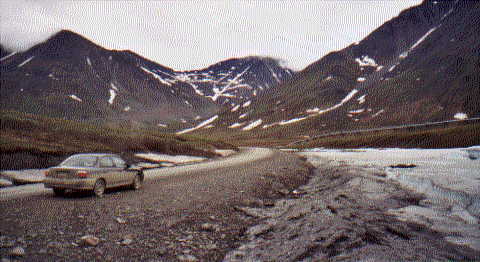 Actually, the car trunk was still filled with crap that I had collected along my journey--stuff that I now realize was just unnecessary, added weight that I should have left at the hostel in Fairbanks rather than hauling it all to the Arctic Ocean and back! 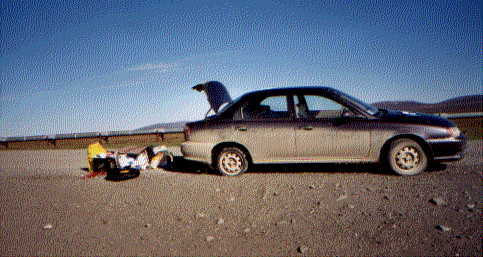 But my car was pretty new, a 1999 Kia Sephia still under warrentee, so I was fairly sure it wouldn't break down--even though I had put it through hell over the past 2 months driving over mountains and through deserts. It hadn't given me any trouble. And it was June, sunny and warm, I figured I'd just take a quick ride up to the Artic Ocean and be back in a couple of days. Note: Get gasoline when you can. 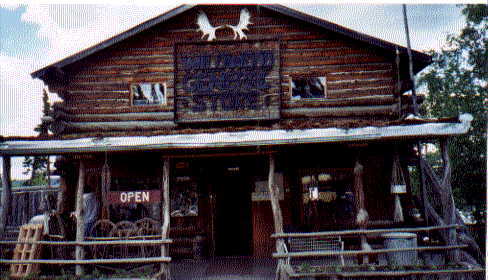 Below: The Wildwood Store near the beginning of the Dalton Hwy. Of course, I had to buy post cards, T-shirts, ect. 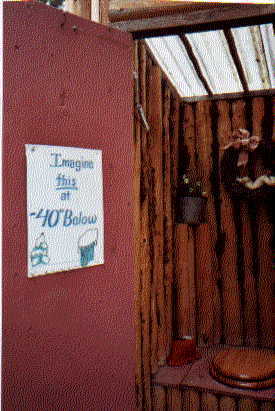 "Imagine this at --40 degrees Below Zero!" PLEASE DON'T CLIMB ON THE PIPELINE! "A Few Words About Emergencies"
The presence on the ground of crude oil, or a heavy black substance. A black spray above the pipeline or coming from the ground. A hissing or roaring sound of liquid escaping from under pressure. A white cloud of steam or fog. 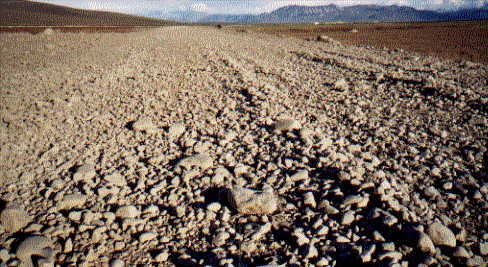 A patch of dead or discolored vegetation. Right: The Yukon River Bridge--This stop consists of a store/river tour/gas station--one of the only 3 places to get gasoline. Next gasoline and hint of civilization is Coldfoot--120 miles north. Never in my life thought that I'd get the chance to drive over the Arctic Circle!!! Took two days to drive from Fairbanks to Deadhorse. Spent the first night sleeping in my tent in the woods just off the road near Coldfoot . Linda, the hosteller from Holland, slept in my car. The next morning she caught a ride back to Fairbanks with a truck driver out of Coldfoot. She had to be back in Calgary in two days. I continued on to Deadhorse. Right: "Up the road" from Coldfoot. Approaching the beautiful boreal forest. Morning mist hanging over the mountains. The road conditions were getting progressively worse. Right: Whoa! And this is just the BEGINNING of the Brooks Range! I have to drive all the way over them to the flat tundra! Above: Time to HYPERVENTILATE! It was great! Every curve and bend was an adventure! And my little Kia kept going! And it doesn't even have 4-wheel drive. Left: Made it over the mountains. Now the "really" bad road began. Ah, so that's why they recommended 6-ply tires. 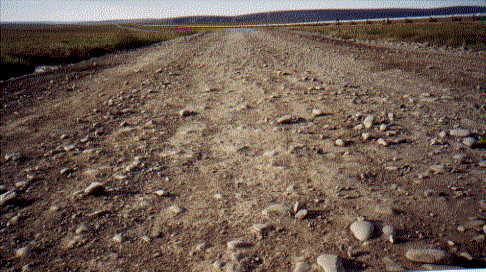 Some of the road was like driving over a dry river bed. Many places I could not drive over 10 or 15 mph. And I knew that I had to drive BACK over this same road! There's only one way in, and one way out of Deadhorse--and the Dalton is it. Right: Well, it was bound to happen sooner or later. 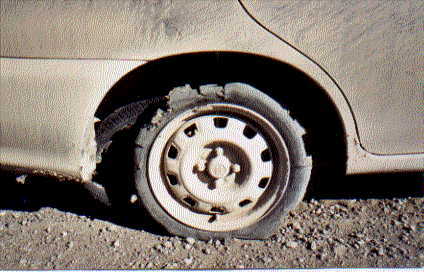 My first flat tire during the entire trip. Actually I got 2 flats at the same time. The rear tire was destroyed, so I had to use the little "donut" spare tire. I couldn't get the lug nuts off. A truck w/pipeline workers stopped to help me. The front tire was not completely flat, so I used the can of "Fix-A-Flat". Then hobbled the next 120 miles to Deadhorse at between 10 and 40 mph. I just prayed that I didn't get another flat before I got there! Left: Fixing the flats. A lot of useless junk in the trunk. It's 240 miles from Coldfoot to Deadhorse. I got my flat tires exactly half way in between. About 120 miles in either direction to a gas station. Deadhorse--I'm on my way! Kept my fingers crossed--please, no more flat tires! Above and Below: The Arctic Tundra. I saw herds of Elk and/or Caribou. Musk ox too! I made it to Deadhorse! Now what? First thing--get the tires fixed. The tire place said that they didn't have any tires to fit my car. They don't usually get cars as small as mine way up there. So I had to take a tire that was a little on the big side. Plugged the other tire. Above: Look at the size of these tires! They are as big as my car. They were free too. The back of my car was so dirty you couldn't even see the bumper! 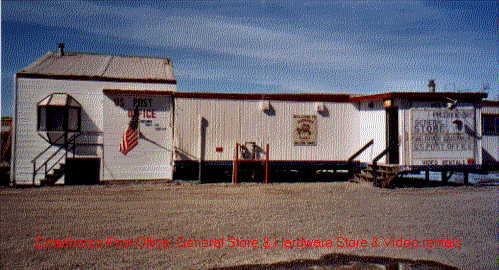 Left: The Deadhorse Post Office, video store, and general store. Bought more post cards & stuff. There were very few people around. Very few. I might have seen a total of ten. I guess most of them were at work on the oil refinery. Went to the restaurant and had a cup of coffee. Filled out my 17 post cards. Mailed them. Walked around for awhile. Had to decide what to do. It was probably around 5PM. It wasn't going to get dark. I had to decide whether I wanted to stay in Deadhorse or turn around and head back towards Fairbanks. Thought about sleeping in my car out by the little airport. The woman at the restaurant said that other people do that too sometimes. I just didn't want to pay and arm and a leg for a bunk. I know, I'm so cheap! But it would be hard to get to sleep because it's so early, there's nothing to do, and it's going to stay light all night. I'd never be able to fall asleep. I'd be just as tired in the morning as I was then. So I might as well head back now (which was then--well, you know what I mean!). Plus, I kept thinking about that long ride back over that 460 miles of dirt & gravel. The sooner I got started, the sooner it would be over. I had seen all of Deadhorse. There wasn't even a coffee shop. And I couldn't sit in the restaurant for hours. I probably could have. But I didn't want to . There was no library, no park, no church, no beach, no trees to sit under, no bench to sit on, no place to just hang out and relax for an hour or two. It was pretty desolate. But the important thing was that I wanted to see what it looked like, and I saw it. 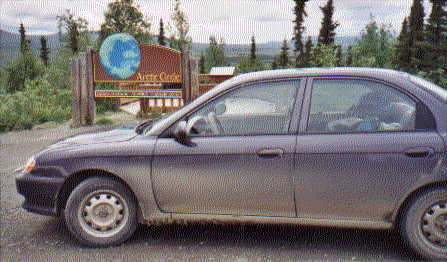 I had crossed the Arctic Circle, drove north past Coldfoot, and drove all the way to Deadhorse, Alaska. It was not easy, but I did it. It was an experience. I saw animals in the wild that I had never seen before. I saw the boreal forests, the tundra, Brooks Range, and glaciers. Oh yeah, I'm glad I did it. Leaving Deadhorse. 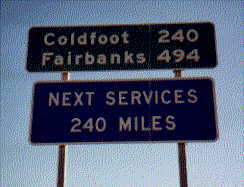 Only 240 miles to Coldfoot, and 500 miles back to Fairbanks!